We all hear that we’re in the lucky country, but did you know the label was coined by historian Donald Horne, in his book of the same name? He says, “Australia is a lucky country run mainly by second rate people who share its luck.” Apparently Horne was referring to the fact that settler Australia never had to earn its own democracy – we never had to work for it. It was transposed with colonisation. Curated by Bundoora Homestead Art Centre’s senior curator Claire Watson, in collaboration with guest curator Sophia Cai, Lucky? can be interpreted from many angles. 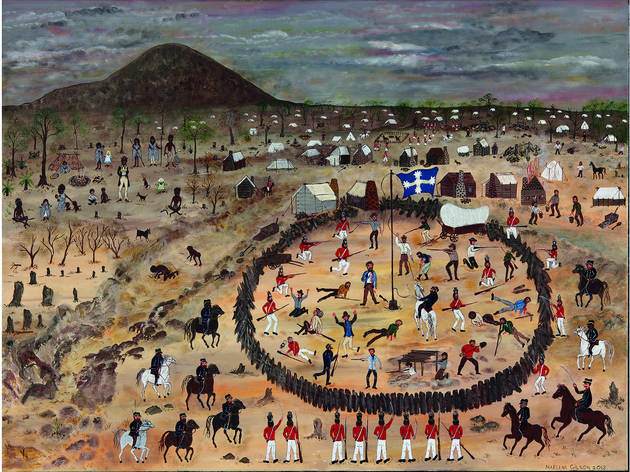 The exhibition shakes up Horne’s perspective, with the inclusion of Indigenous voices, voices that were historically shunned by White Australia (especially during and after the gold rush), and western voices. Not only is Australia lucky in terms of mineral and environmental wealth – which could be attributed to an historic caring for the land – but cultural wealth as well. This is clear from the scope of the works in the exhibition, and particularly evident in the multi-layered and sprawling work of Wathaurung artist, Marlene Gilson, whose works recently featured in the Biennale of Sydney. Her paintings really do tell a million stories – they’re as detailed as miniature paintings, but set across large canvasses, and often feature the artist’s interpretation of a real-life historical scene. 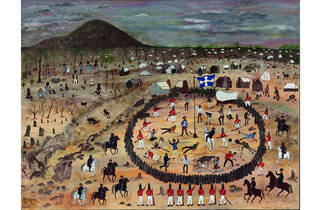 The work in this show, ‘Mount Warrenheip and Eureka Stockade’ (2013), tells the story of the Eureka Stockade, and the supposed birthplace of democracy in this country, but from an Indigenous perspective. Canberra-based artist Raquel Ormella works across different media, from whiteboards to participatory work to textiles. 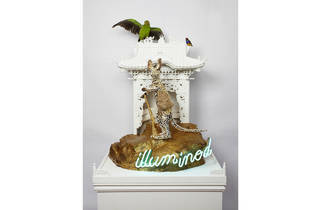 Broadly, the artist explores explores themes around the environment, protest, culture at large and feminism. Ormella is well-known for her flags, which feature political messages sewn into them – the most wry stating ‘I’m worried this will become a slogan’. 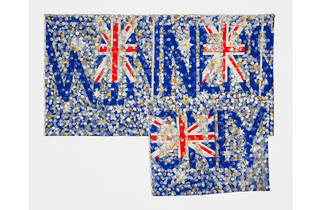 One of the artist’s flags, ‘Wealth for Toil #2’ (2014), featured in Lucky?, is emblazoned with the words ‘Winner Only’, on top of Australian flags, with what look like translucent coins stitched over the top. John Young is a Hong Kong-born, Australian artist whose conceptual work often focuses on themes of journey and migration, with a specific focus on Chinese diaspora. In this exhibition, three paintings from his 'None Living Knows' (2017) series are featured. Abstract in style, they portray a blurry landscape as metaphor for the story of unspoken journeys: in particular, the journeys of Chinese migrants and miners who walked from Darwin, through Croydon, Cairns and other parts of Queensland in search for gold. They're almost ghostly, these abstract landscapes. 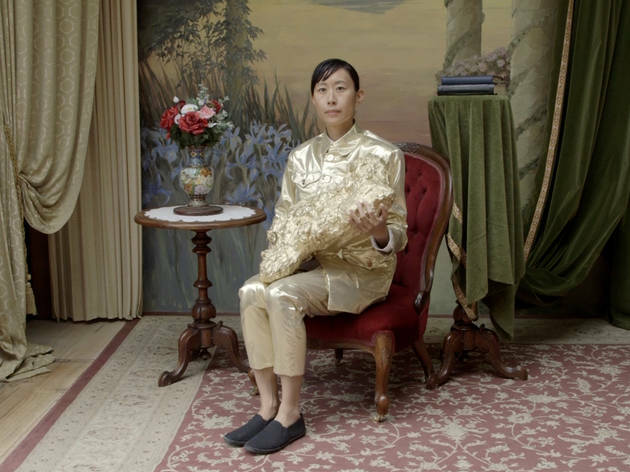 Also exploring the perspective of Chinese diaspora in Australia, Melbourne-based Eugenia Lim’s video and prints from the series, ‘Yellow Peril’ (2015) are featured in the exhibition. There are three components to the work shown in the exhibition: one video work and two prints on gold emergency blankets. The work as a whole takes Ron Robertson-Swann’s sculpture, ‘Vault’ (1980), a famous public artwork situated on the corner of Grant and Dodds Sts in Southbank, as the starting point for discussions around gold mining, politics and migration. The colloquial name for ‘Vault’ is ‘Yellow Peril’. 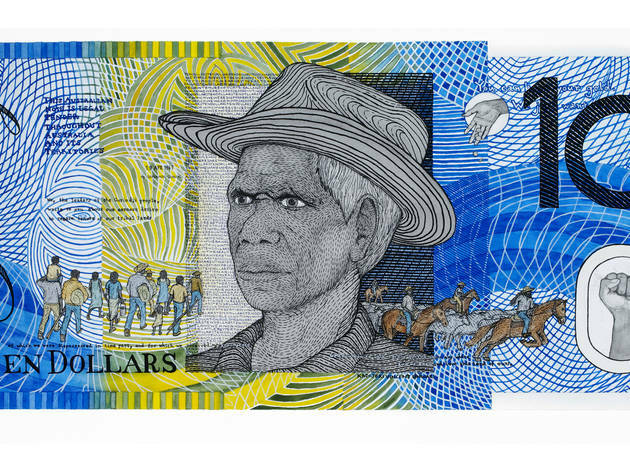 Brisbane-based artist Ryan Presley will present works from his collection of reconfigured bank notes (in which the artist has placed Indigenous warriors in the place of what we see on our notes now). Danie Mellor’s lesser-known sculptural practice will be a highlight for those who haven’t seen his sculptures before – they are often comprised of ceramic materials, neon writing and taxidermied animals. Other artists in the exhibition include Paola Balla, Aliça Bryson-Haynes, Shoufay Derz, Jonathan Jones and Lizzy Sampson. It’s a rich show, full of questions and different perspectives. 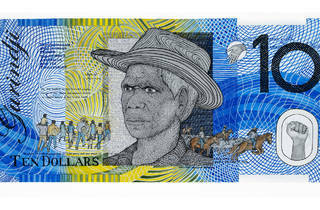 As the curators say, “it provides a chance to reflect on the foundations of contemporary Australian life, from wealth generation, to immigration all seeking a ‘better life’.” You’ll be richer, at least intellectually, after seeing this exhibition.